Monero’s planned upcoming hardfork to the new CryptoNight/CryptoNote V8 proof of work algorithm is going well and will just about a day left and miners already supporting the V8 algorithm people are getting ready to mine XMR. 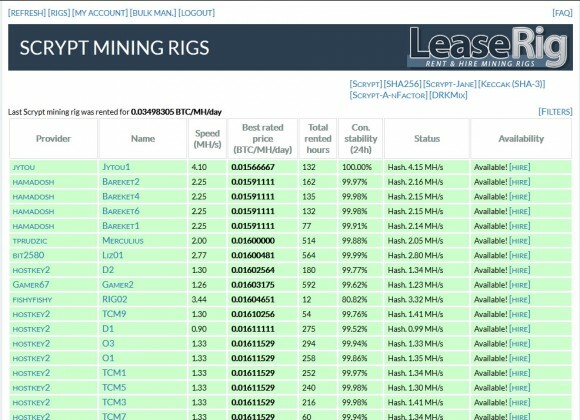 Even services such as MiningRigRentals where you can rent or lease mining rigs are already supporting the new V8 algorithm with rigs available. NiceHash however has also added support for V8, including support for their latest NiceHash Miner, so you can expect quite a lot of hashrate after the fork coming from the service. The SUQA project that we recently introduced is continuing to gain more interest from users and its X22i algorithm has just been added to MRR. The good news for miners is that X22i is still too new and not big enough to catch the interest of NiceHash, though if things continue this way it will happen sooner or later. Anyway, SUQA is developing nicely with network hashrate growing as more users join the mining process and the project is progressing well on their announced roadmap, even though there is still some skepticism surrounding the 10% developer fee from each mined block. LeaseRig is an interesting new service that allows you to rent mining rigs for a limited time period that will mine for you in your preferred pool and your preferred crypto currency for the duration of the lease. 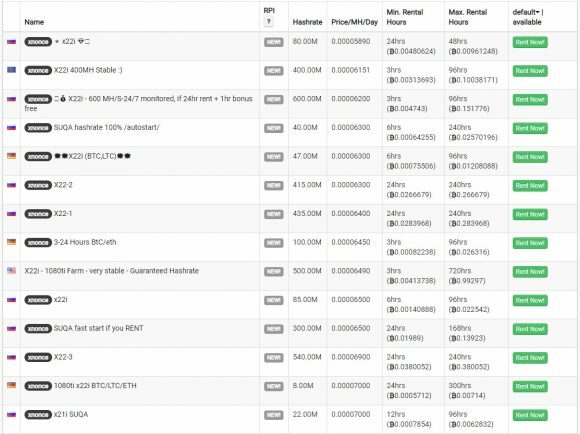 There are mining rigs available for Scrypt, SHA-256, Scrypt-Jane, Keccak (SHA-3), Scrypt-A-nFactor and DRKMix (Darkxoin mining). 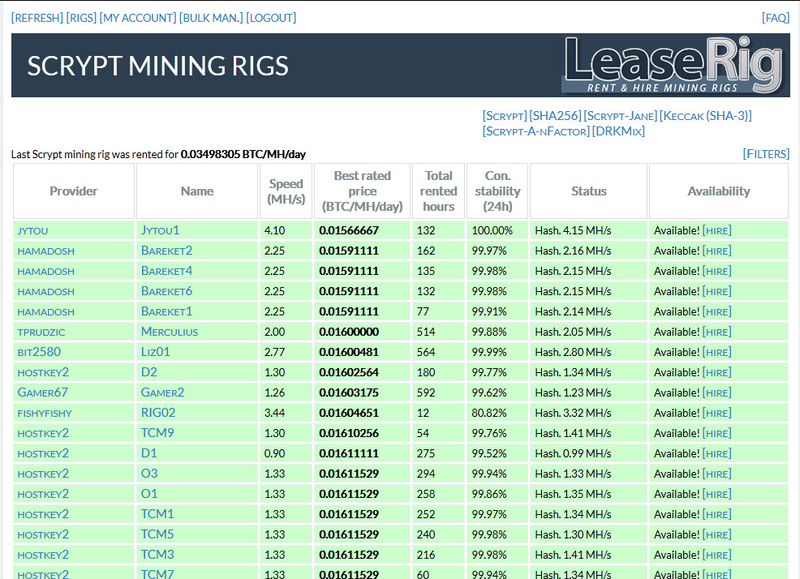 These rigs are provided by users and the service LeaseRig only connects you to the mining rig providers, processing payments and acts as control and monitoring panel. Everything seems very quick and easy to start using the service if you want to rent mining rigs and there are already quite a few available, and we were very excited at first. This is precisely why we have decided to give the service a try by renting a mining rig for 24 hours to be able to actually test how things are working and give you adequate feedback and to make a proper review of the service. In order to test the service we have decided to lease a smaller mining rig for longer period of time, so we choose one that is with 0.62 MHS and have rented it for 24 hour time period. The cost for leasing the rig for 24 hours was 0.01070000 BTC (you can pay only in BTC), and estimating the LTC return rate for 24 hours of mining Litecoin with that hashing power was roughly 0.1945 LTC (0.00485666 BTC). This means if we used the rig to mine LTC the profit we would get will be about half of what we have payed for renting the mining rig, so we have decided to go for the currently more profitable DOGE. The projected mined crypto with that hasrate for a day by the pool (Coinotron) was about 2600-2700 DOGE or up to about 0.00567000 BTC with the current exchange rate. Again less than what we have to pay for renting the mining rig, but we decided to give it a try as we were actually willing to test the service… you can find better prices for higher hashrate and with longer lease time you can end up with profit according to calculations. Everything started very good, the BTC deposit has appeared and was available for use very fast. We have hired the mining rig, removed the rigs default pool settings and set our pool and worker settings for mining DOGE at Coinotron and in a moment the rig started working. For a few hours everything was running smooth and problem free, so we stopped checking the Mining Rig status every few minutes and a few more hours later we checked to see if everything is still fine and it was not. The mining pools and settings were back to the default ones for the mining rig we have rented and it was not mining to our pool (it was gone from the list of pool) and was mining for the rig owner with more than 12 hours left from our contract. This has probably continued for an hour or two at least before we have noticed it, we again changed the pool settings to ours for mining DOGE in Coinotron and have removed the default ones. After that going for some sleep and waking up in the morning and checking the status with just about 2 hours more left from our lease the rig was again back to the default pools and our mining pool info was not in the list and it was not mining for us. This meant that again the rented rig was not mining for us for at least a few hours, again setting the proper settings for the remaining time of our contract and there were no more problems until the lease time has finished. The result from our 24 hour rent of the mining rig was really awful. Instead for the projected 2600-2700 DOGE getting mined for the lease time, we ended up with only about half of that actually mined or about 1300 DOGE. This means that due to the two times that our pool settings were gone and the mining rig was not mining for as as per the contract before us noticing has totaled in probably 12 hours. 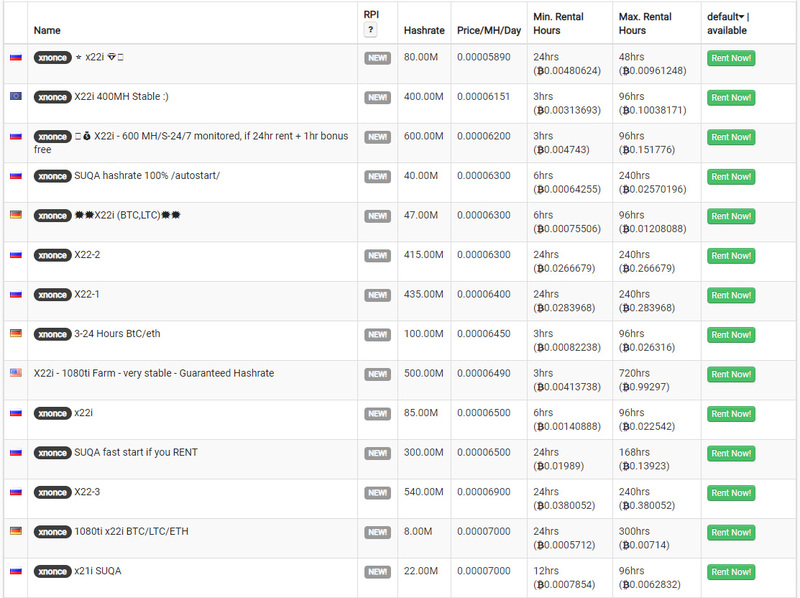 This is really unacceptable, even though after our contract has finished we can still see the leased mining rig mining for us at the Coinotron pool with a slightly lower hashrate for about an hour already we are still not happy at all. After reading a bit more, it seems that the problem with the pool settings getting reverted back to the default set by the mining rig operator can happen if you restart the miner on the rig and you need to manually reset them to your own settings each time. So if the mining rig does not get restarted or the miner software on it at least you might not have the problem with the pools reverting back to the owner of the rig, but in hour 24 hour test we have noticed this happening 2 times (maybe even more) and thus resulting in really very unsatisfactory performance of the service. You cannot expect the people that rent the rigs to be monitoring them all the time during the lease period, especially if you rent multiple rigs and for longer periods of time in order to quickly react should a problem with the pools reverting form the user set ones to the rig’s defaults. The conclusion: we have started by renting a 0.62 MHS mining rig for 24 hours paying 0.01070000 BTC, we have mined Scrypt crypto and more specifically DOGE as it has higher profitability than LTC and at the end of our lease we have ended up with the equivalent of 0.00252630 BTC. So we actually have payed 4 times more than what our actual mining earnings are worth and that is clearly not going to make us recommend the LeaseRig service. We have ended up with half of the expected DOGE mined because of a problem with the system that reverts the mining pools to the mining rig’s defaults instead of using our mining pool and worker, so this has essentially halved our expected earnings. So for now you better not go for the LeaseRig service, until at least they figure a solution to the problem with the pools getting reset. But even without that pool issue we have experienced it is hard to go for a lease of a rig that will not only cover what you have payed for renting it, but will end up with some profit for you! You could actually be more interested in becoming one of the mining rig providers and earn some cash for leasing your mining rig equipment, because this actually seems more profitable than to be renting rigs.